Pylon Conduit for Pocket PC - Experience the power of Lotus Notes on a mobile PDA or smartphone, including remote access to corporate email, calendar, contacts, task lists, memos and expenses. Pylon Conduit® lets you sync your Pocket PC or Palm OS-based device to your desktop to dramatically improve productivity without requiring involvement of corporate IT departments or development resources. Mobility has never been so powerful, so robust and so simple. With Pylon Conduit mobile users can improve their productivity with access to Lotus Notes email and PIM data through a device cradle and desktop computer. 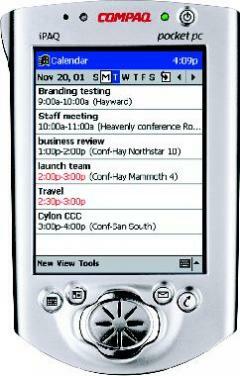 PIM information is accessible through native applications on Palm or Pocket PC devices. Pylon Conduit also provides access to email attachments discussion databases, journals and multiple address books and calendars. Pylon Conduit extends your existing Lotus Notes infrastructure, leveraging Lotus Notes security. Individuals are automatically authenticated against the Lotus Domino® directory for simple setup and administration with no demand on IT resources or special access to Domino servers necessary?it simply uses existing Access Control Lists (ACLs). Pylon Conduit provides a simple Notes database, so users can configure, filter and control access to PIM data, saving time and money, and providing a greater return on your existing Lotus Notes investment. To assist in your successful installation, included in your purchase is a one-time, free support email to be used within the first 30 days after purchasing software.